Spray over powdered creme makeup, clown makeup and special effects designs for a lasting finish by Ben Nye Makeup. 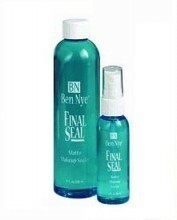 Final Seal by Ben Nye Makeup sealer keeps your makeup waterproof and in place for hours. Spray over powdered creme makeup, clown makeup and special effects designs for a lasting finish. Final seal may also be used as a mixing agent for Lumiere Colors. Artist and performers appreciate the no clog spray, matte finish and light mint fragrance. Take precaution around eye area and on sensitive skin. Remove with Hydra Cleanse. Top Hat Magic in Tulsa Oklahoma sell this and many other Ben Nye Makeup products. This must be shipped Ground only. 2 fl. oz.